Note: I have decided to take the following review verbatim from my personal journal, so pardon its rawness; also pardon the misalignment of lines that should be indented in the excerpt from “Watching People Walk Along.” Since writing this I have researched a bit more about Gelman’s life, but rather than add information or clarifications I will leave you, gentle reader, with the impressions of the moment. For further review of his work I refer you to Lucina Schell’s excellent review at her Reading in Translation blog (www.readingintranslation.com). 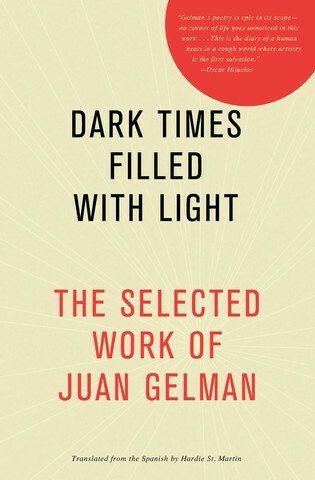 Dark Times Filled With Light: The Selected Work of Juan Gelman. Translated by Hardie St. Martin. 2012. Rochester, NY: Open Letter. 187 pages. It appears to be in this collection that he began using the slashes within lines of verse (in the short excerpt above, from “Watching …,” I have inserted the slashes as per standard practice to indicate line breaks). like a cloud / passes on (p. 161). (“Moments During the Battle of Alfuente,” p. 162). There is so much more that I could cite, but I am running out of pages in this journal and I imagine that what I have already cited and said will do enough for a sampling and a response. I have never read verses that have affected me more profoundly. 12/9/13: I have myself never belonged to the Communist Party or any officially Marxist organization, but I did make the painful migration from my conservative Republican upbringing to the “radical” left wing of the Democratic Party – even voted twice for the “socialist” Barack Obama! And, yes, I sympathize with Marxist ideals, if not with the excesses of some of its proponents and practitioners. 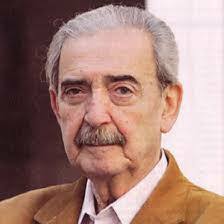 I think that something like that was going on in Chile, with Salvador Allende’s democratic election, until Pinochet (with the aid and counsel of our CIA) murdered him and overthrew that government. I remember reading Allende’s niece Isabel Allende’s novel La casa de los espíritus (The House of Spirits), which included some horrifying description of a conservative anti-democratic revolution very closely modeled on Pinochet’s historical one. I have since read nonfictional accounts that closely mirror her fictional one. I was shocked at the time by the political sabotage that went on, before the coup, with the clear intention of destabilization of Allende’s government: the image from the novel that still stands out in my mind is of perfectly good food rotting in store windows because the interests of wealth refused to sell it at a price that the working class could afford. I have often thought of that when I hear people say that “Socialism” has been discredited and that Capitalism represents the “best of all possible worlds.” And I have thought about it throughout Obama’s years in the White House as Republicans in Congress have openly sought the destruction of his agenda, with dishonest epithets with Marxist and Racist overtones. And while in my dark moods I often despair of our ever overcoming the deep-seated American assumptions that keep us from a humane and rational blend of capitalistic and socialistic economic strategies (I have always been of a melancholic temperament), every now and then there is still a glimmer of hope: whether it is Bill de Blasio’s mayoral win in NYC, or Elizabeth Warren’s campaign to make Wall Street honest, or any number of little signs of populist / progressivist activity. In the spirit of that hope I modestly say: ¡Viva la revolución democrática! May it be resounding, aggressive, and peaceful.